Josephine is staring down her 50th year of life and has never had a circle of gold wrapped around her left ring finger. That fact bothers and saddens her. As I tried to share words of encouragement, rancor crackled in her voice as she nearly cut me off. “I’ve heard all that before,” she said. She quickly wiped away a tear before it could spill down her face. Whenever I think of Christian women who are single, the train of thought always leads to biblical women who were childless. Their stories of longing are abundant throughout the Bible and are rich with emotion. And while the object of yearning is not the same, the intensity is. Bitter envy, furious frustration, teary grief, and pure passion are seen in both wishes. And the elongated duration of either condition, singleness or childlessness, can lead to pulling a Hagar. Sarai, like Josephine, was tired of waiting. The couple was well into their golden years; her husband, Abram, in his nineties and Sarai in her eighties. God knew their desire and had promised Abram a son. But ten years had passed since then without the slightest hint of morning sickness. But Sarai didn’t get the family she wanted. Heavy yearning can blind eyes and invite trouble instead of turning it away. I imagine that Sarai’s faith and hope had dwindled down to such a wisp that being a stepmother of sorts was better than being a mother of none. But that arrangement was not arranged by God. Sarai and Abram’s promised son eventually did arrive just the way God intended. But the effects of Sarai’s tactic were still felt years later. In the midnight moments, when the last drop of faith has evaporated, it’s tempting to pull a Hagar. But it’s even wiser to wait for God. Nancy’s red curls bounced as she arranged the cakes on the table. 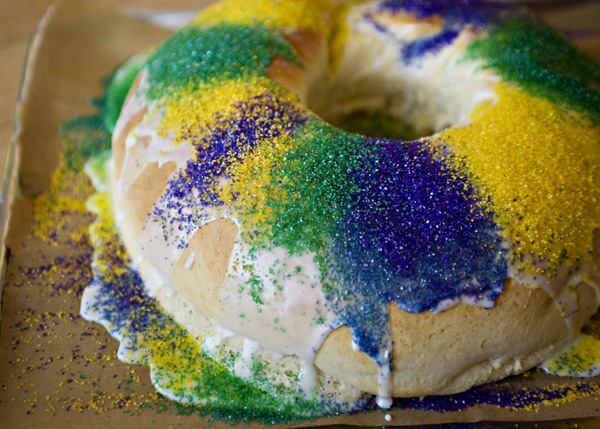 We were nowhere near New Orleans but that didn’t mean we couldn’t celebrate Mardi Gras. On a gray Tuesday morning, Nancy decided to brighten up our work day with a sugary breakfast of King Cake. As I cut a slice of the cinnamon, Nancy told me the history of the office king cake and the recipients of the storied plastic baby. The next morning when I got to my desk, sitting in a jumbled nest of violet and turquoise beads, was a tiny smiling baby. I was so sure 8 hours ago. I had just received a job offer for a position I had been praying about and really wanted. I was overjoyed and had thanked God profusely. But that evening as I mentally rewound the day’s events, the euphoric solidity I held in my hands began to soften. Did God really want me to take that job? Gray. Those pieces of life that, unpredictably and without reason, go from clear to vague. An issue becomes as foggy as a moist morning, as fuzzy as nearsighted vision. Whenever God speaks to His people, imparts His wisdom, and reaffirms His love, satan always tries to smudge His meaning, cloud His intent, and dispute His words. Since creation, he has tangled black and white into a DNA helix twist to create gray messes. In Genesis 2, God clearly tells Adam he may eat of any tree in the Garden of Eden except the Tree of the Knowledge of Good and Evil. Did he really say it? There could be no mistake. The Lord clearly stated which trees were good for food. It’s amazing to see how we can go from knowing the absolute truth from the mouth of God to believing the absolute untruth from satan. All because satan made what was crystal clear into opaque gray. Reminded that gray is not part of the rainbow.